If Holland Bar could muster up the beer muscles to eat Times Square whole it would be the bad-old days all over again, sin and loathing in NYC. All these winos screaming, "Travis Bickle back!" That's a fantasy. 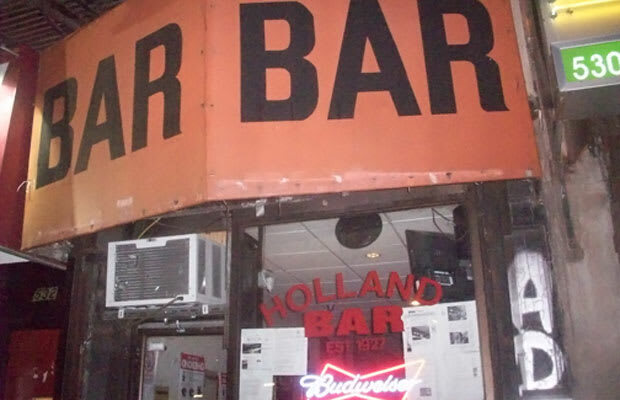 The reality is, Holland Bar is a dive of the first-order. The walls are collages of poorly-lit photographs of regulars living side-by-side with yellowing newspaper clippings, suggesting that the bar and the happenings of the world exist on the same plane of importance. The Yankees win in 1983 and Bill the Drunk photographs his third wife looking lurid in the neon—it's all the same. It's all beautiful.